The history of the Terni Steelworks begins in the last decades of 1800's, when, in order to make up for the energetic needs of the Arms Factory, erected on the outskirts of the town from 1881 and the development of the most important private enterprises, such as the iuta factory "Centurini", the wooden factory and the foundry, was the channel "Nerino" eroded in 1879. The carrying out of this waterworks, which represents the first intervention of this kind destined to industrial purposes in Italy, guarantees the ideal conditions of the supply of motive power, for the following birth of the Terni steel plant in 1886. The first steel plant in Italy, and the ironworks, which grows up around it, causes a radical transformation to the urban plant of the city, but also to the landscape of the entire valley. The necessity to accommodate the factory workers, in fact, determines the building of many new habitations, structures for social services, and other infrastructures, which add a large number of working-class neighbourhoods in the historic centre of Terni. Few kilometres upstream along the valley of Nera river, moreover, the Velino Falls are harnessed, so as to generate electrical energy in the central of Galleto that, in 1929, the year of its inauguration, with an estimated power of more than 250000 KW/h, it is considered as the bigger and most powerful one of the whole Europe. 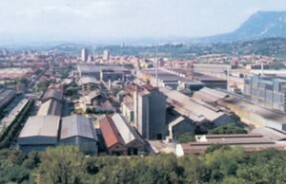 The town of Terni, in this way, is deeply attached to its steel plant, which nowadays, with the denomination of Acciai Speciali Terni o AST Terni, is controlled by the German multinational ThyssenKrupp, whether for historical causes, or for the impact on the economy and the work market of that area. Not casually in the February of 2004, in order to save the plants for the magnetic production and the relevant jobs, more than 25'000 citizens came out into the streets accompanied by the most important politics persons of the country. "ThyssenKrupp Acciai Speciali Terni is among the first world manufacturing of stainless and magnetic planes, with its centennial experience, as world dimension Group for the modern and advanced plant engineering, the technological and productive innovations, the rigorous quality control that guaranties a whole production of high level, the scrupulous technical assistance to the customers, the volume and extension of the trade, the results of the metallurgic research developed in collaboration with the Material Development Centre." "ThyssenKrupp Acciai Speciali Terni has a prominent role in the field of the silicon steels for the electrical applications. In this sector the Enterprise is able to offer high quality products, that satisfy the most various demands. The range is including of the conventional oriented grain sheets and the high permeability sheets. Such products, used for power and distribution transformers, allow all the possible applications for which are requested elevated magnetic features with preferential orientation. The quality is guarantied by testing methods in conformity with the most important International Rules, and the immutability of the magnetic properties is guaranteed by their constant on line survey. The constant and settled care in the research and development activities with the Material Development Centre, made possible to develop a high technical know-how process and products with some of the best performances, in terms of magnetic quality, that are in the market…"